Andrey P Jivkov is a Professor of Solid Mechanics in the School of Mechanical, Aerospace and Civil Engineering at the University of Manchester, UK. He received his PhD in Mechanics in 2002 from Lund University, Sweden, and his MSc in Structural Engineering in 1994 from the University of Architecture, Civil Engineering and Geodesy in Sofia, Bulgaria. Since 1997 he has worked exclusively for the nuclear sector: as a researcher in Sweden and UK (1997-2007); as a professional consultant on structural integrity of high integrity plant at Serco Assurance UK, now AMEC Foster Wheeler (2007-2010); and as an academic staff at Manchester (2010-). 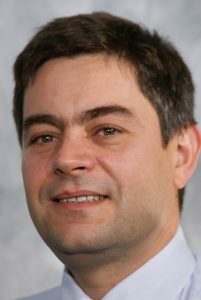 Presently, Prof Jivkov leads the Mechanics and Physics of Solids Research Group at his School and is the Research Director of the EdF Modelling and Simulation Centre at Manchester. The research of his group spans from integrity of metallic materials, including cleavage and ductile fracture and environment-assisted cracking relevant to PWR and BWR components, through damage and failure of quasi-brittle materials, including cement-based and nuclear graphite relevant to AGR, to reactive transport in porous and fractured media relevant to deep geological disposal of nuclear waste. Prof Jivkov’s research is conducted in collaboration with a number of universities in the UK, Europe, USA, Brazil and China, and supported by a number of nuclear businesses, such as EdF France, EdF Energy NG, AMEC Foster Wheeler, Rolls-Royce, NNL and CGN.